This page is a list of Christmas dishes as eaten around the world. These food items are traditionally eaten at or associated with the Christmas season. This is a traditional Albanian pie cooked usually on Christmas Eve, especially in Catholic families. The ingredients are wheat flour, pumpkin, walnuts, vegetable oil (if fasting is considered) or butter, a pinch of salt and black pepper. Sometimes oregano is added. The pastry layers are traditionally homemade, filled with baked pumpkin mixture, which contains butter, salt and pepper. On top of the mixture, chopped walnuts are sprinkled. Layers are then folded up, put on a flat baking dish in a circular shape and baked. It makes a very delicious and light side dish for Christmas or any other occasion. 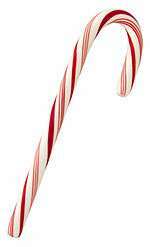 Candy Cane can be hung as edible decorations. Christmas damper - in wreath or star shape, served with butter, jam, honey or golden syrup. Made in the Australian bush in the 19th century. Pan de Pascua - Chilean Christmas sponge cake flavoured with cloves and with bits of candied fruits, raisins, walnuts and almonds. Ponche a la romana - Eggnog-style beverage made of champagne and pineapple-flavoured icecream. Sweet bread filled with fruits like raisins and raspberries. Crema De Vie - Cuban eggnog, made with condensed milk, rum, sugar syrup, lemon rind, cinnamon, and egg yolk. The traditional meal (served as dinner on Christmas Eve) consists of either fish soup or pea soup and fried fish (traditionally carp) served with potato salad. The recipe for potato salad differs slightly among every Czech family. The main ingredients are: potato cooked with jacket, canned peas, onions, cooked carrots, parsley and celery, pickled gherkins, cooked eggs and mayonnaise. Some families may add grated apples or salami. The best potato salad is prepared a day before Christmas Eve so that all the ingredients can "mellow" for a day. The Christmas dinner should be the first food consumed that day. Those who do not break the Christmas shrove are believed to be able to see a golden pig on a wall. Before the Christmas holidays, many kinds of sweet biscuits are prepared. The Christmas cookies are then served during the whole Christmas period and exchanged among friends and neighbours. 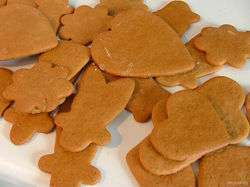 Very popular is also a preparation of small ginger breads garnished by sugar icing. 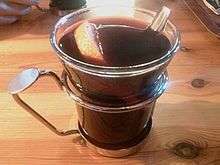 gløgg - mulled red wine combined with spices, sugar, raisins and chopped almonds typically served warm. Christmas cookies - Vaniljekranse, klejner, jødekager, pebernødder, honningkager og finskbrød. Konfekt, marzipan, caramelised fruits, nougat and chocolate-covered nuts. Fruit platter - consists of oranges, apples, bananas, grapes, and mangos. 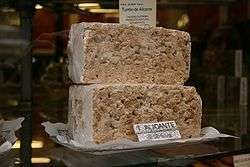 Thirteen desserts (Provence): The thirteen desserts are the traditional Christmas dessert in the French region of Provence. The Christmas supper ends with 13 dessert items, representing Jesus Christ and the 12 apostles. The desserts are traditionally set out Christmas Eve and remain on the table three days until December 27. Christstollen Stollen is a fruitcake with bits of candied fruits, raisins, walnuts and almonds and spices such as cardamom and cinnamon; sprinkled with confectioners sugar. Often there's also a core of marzipan. Schäufele (a corned, smoked ham) usually served with potato salad in southern Germany for dinner on Christmas Eve. Hamborgarhryggur, a smoked, cured pork roast. Ptarmigan, gamebird in the grouse family. Caramelised potatoes, Icelandic. 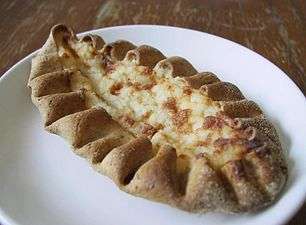 Brúnaðar kartöflur (same as in Danish cuisine). Laufabrauð - round, very thin flat cakes with a diameter of about 15 to 20 cm (6 to 8 inches), decorated with leaf-like, geometric patterns and fried briefly in hot fat or oil. Christmas cake - a type of fruit cake. Mathri - a traditional flaky biscuit. Gulab Jamun - A traditional sweet prepared with khoa. Kheer Boiled rice cooked with milk, sugar, saffron and is garnished with nuts such as almonds and pistachios. It can also be made with barley. Chhena Poda - A dessert made with Chhena (cottage cheese) which is slightly roasted and soaked in sugar syrup. It is garnished with cashew nuts and served. Chhena Poda is popular in the Odisha state of India. It is eaten during the Christmas season but is available throughout the year. dumplings- dumplings filled with Indian spices with a sweet or savoury filling. Neureos - a kind of dumpling made of semolina, khoa and nutlet. Bebinca- A dessert popular in Goa which is eaten during Christmas season. Stew- Stews prepared with chicken, mutton, fish. Pork vindaloo- A spicy goan curry with pork made during Christmas. Fruits, such as apple, orange, guava. drinks, such as cider, ginger ale, etc. 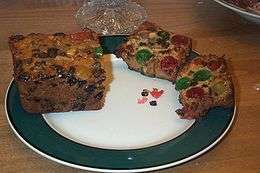 Christmas (fruit) cake or black cake - a heavy fruit cake made with dried fruit, wine and rum. sorrel - often served to guests with Christmas cake; Sorrel is made from the same sepals as Latin American drink "Jamaica," but is more concentrated and usually flavored with ginger. Adding rum is traditional at Christmas time. Rice and peas - a Sunday staple, at Christmas dinner is usually made with green (fresh) gungo (pigeon) peas instead of dried kidney beans or other dried legumes. Christmas cake - Different from a UK Christmas cake or American fruitcake, the Japanese style Christmas cake is often a white cream cake, sponge cake frosted with whipped cream, topped with strawberries and with a chocolate plate that says Merry Christmas, though yule logs are also available. KFC fried chicken - With turkey as a dish being virtually unknown in Japan the popularity of this item at Christmas is such that orders are placed as much as two months in advance. Twelve-dish Christmas Eve supper - twelve dishes representing the twelve Apostles or twelve months of the year - plays the main role in Lithuanian Christmas tradition. 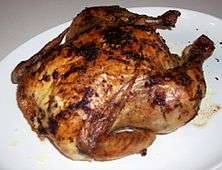 The traditional dishes are served on December 24.
pavo - Stuffed, roasted turkey served with gravy. Russian potato salad - Side dish to turkey, particularly popular in northern states. Bacalao - clipfish or cod, traditionally eaten in the central and southern states of Mexico. Tamales - Tamales can sometimes replace the traditional turkey or Bacalao with romeritos, particularly in northern and southern parts of Mexico. Menudo - A Christmas morning tradition in northwestern states, menudo is a tripe and hominy soup, not to be confused with southern 'panzita'. Menudo is often prepared the night before (Christmas Eve) as its cooking time can take up to 5 hours. Pineapple upside-down cake - Turned-over cake with cherries and pineapples. Glazed ham - Ham glazed with honey or sugar with cherries and pineapples on top. A homemade Christmas pavlova decorated with pomegranate seeds and Chantilly cream. Julepølse - Pork sausage made with powdered ginger, cloves, mustard seeds and nutmeg. Served steamed or roasted. Julebrus - is a Norwegian soft drink, usually with a festive label on the bottle. It is brewed by most Norwegian breweries, as a Christmas drink for minors. Puto bumbong - a purple-coloured Filipino dessert made of sweet rice cooked in hollow bamboo tubes placed on a special steamer-cooker. When cooked, they are spread with margarine and sprinkled with sugar and grated coconut. 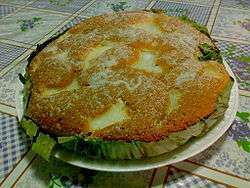 Bibingka - traditional dessert made with rice flour, sugar, clarified butter and coconut milk. baked in layers and topped with butter and sugar. 12 dishes are served as a reminder of the 12 Apostles on Christmas Eve, 24 December. Polish people don't eat meat on this day, instead they choose from variety of fish and vegetable dishes. The meal begins when the first star is seen. 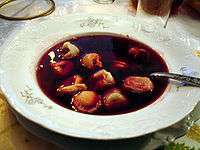 barszcz (beetroot soup) with uszka (small dumplings) - a classic Polish Christmas starter. Kompot - traditional drink a light, refreshing drink most often made of dried or fresh fruit boiled in water with sugar and left to cool and infuse. Sałatka jarzynowa - salad made with boiled potatoes and carrots with fresh peas, sweetcorn, dill cucumber, and boiled egg, mixed with mayonnaise. 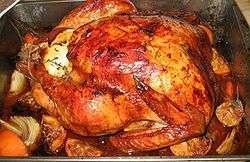 Turkey - On the island of Terceira, turkey has recently taken over as the traditional Christmas dish over Bacalhau, due to the influence of American culture on the island, home to the United States Air Force's 65th Air Base Wing. Arroz con gandules - yellow-rice and pigeon peas with olives, capers, and pieces of ham. Escabeche - boiled green bananas and chicken gizzards in Puerto Rican style escabeche. Pastelón - sweet plantain "lasagna". Potato salad - made with apples, chorizo and hard-boiled eggs. Coquito - Puerto Rican spiced coconut eggnog. Rum punch - dark or light rum, pineapple rum, orange liqueur, grenadine, ginger ale, grapefruit juice served with lemon and lime slices. La Danza - Champagne with passion fruit juice, orange liqueur, lime juice, lemon juice, and strawberry juice. Arroz con dulce - coconut rice pudding with spices and raisins. Bread pudding - soaked in coconut milk and served with a guava rum sauce. Dulce de cassabanana - musk cucumber cooked in syrup topped with walnuts and sour cream on the side. Dulce de papaya con queso Boricua - spiced papaya candy in heavy syrup served with Puerto Rican white cheese. Flancocho - Crème caramel with a layer of cream cheese and Puerto Rican style spongecake underneath. Majarete - rice and coconut custard, made of coconut milk, milk, rice flour, sugar, and vanilla or sour orange leaves with cinnamon served on top. Tembleque - a pudding made with cornstarch and coconut milk. Mantecaditos - Puerto Rican short bread cookies. Made with shortening, coconut butter, flour, almond flour, vanilla, nutmeg and almond extract. They are usually filled with guave jam or pineapple jam in the middle. 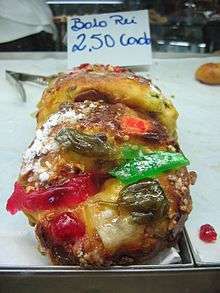 King cake known as roscón de Reyes in Spanish and tortell in Catalan. Dopp i grytan ("dipping in the kettle") - dipping bread slices in the ham broth after boiling the Christmas ham. Vörtlimpa - Swedish rye bread with grated orange peel made for Christmas, with or without raisins. Lussekatter - Saint Lucy saffron buns. In Trinidad and Tobago traditional meals consists of generous helpings of baked ham, pastelles, black fruit cake, sweet breads, along with traditional drinks such as sorrel, ginger beer, and ponche de crème. The ham is the main item on the Christmas menu with sorrel to accompany it. In the United Kingdom, what is now regarded as the traditional meal consists of roast turkey with cranberry sauce, served with roast potatoes and parsnips and other vegetables, followed by Christmas pudding, a heavy steamed pudding made with dried fruit, suet, and very little flour. Other roast meats may be served, and in the nineteenth century the traditional roast was goose. The same carries over to Ireland with some variations. Oyster stew, composed of oysters simmered in cream or milk and butter. 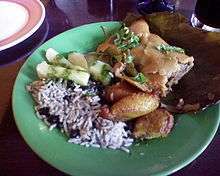 Stuffing, also known as dressing, particularly in the Southern U.S.
Hallaca - rectangle-shaped meal made of maize, filled with beef, pork, chicken, olives, raisins and caper, and wrapped in plantain leaves and boiled to cook. Pan de jamón - ham-filled bread with olives and raisins and often sliced cheese. ↑ "Receta del Vitel Thoné de Argentina" (in Spanish). SaborGourmet.com. November 9, 2011. Retrieved 25 December 2012. ↑ "Vitel toné" (in Spanish). Clarín.com. June 16, 2005. Retrieved 25 December 2012. 1 2 3 4 5 6 "Juicio a la mesa de Navidad: los platos típicos tienen el doble de calorías y cuestan 70% más" (in Spanish). Clarín.com. December 21, 2012. Retrieved 25 December 2012. ↑ "Navidad y los excesos en las comidas" (in Spanish). Cocineros Argentinos. Retrieved 25 December 2012. ↑ "El abecé del mejor pan dulce" (in Spanish). Clarín.com. December 19, 2012. Retrieved 25 December 2012. ↑ "Dos extraños al frente del asado de Navidad" (in Spanish). Clarín.com. January 3, 2012. Retrieved 25 December 2012. 1 2 3 4 "Canasta navideña cuesta $281 pesos según informe del ISEPCI" (in Spanish). Momarandu.com. December 22, 2012. Retrieved 25 December 2012. 1 2 3 4 "Calcule cuánto cuesta su canasta navideña" (in Spanish). Lanacion.com. December 21, 2012. Retrieved 25 December 2012. ↑ "Comida navideña con sabor solidario" (in Spanish). Larioja.com. December 26, 2012. Retrieved 25 December 2012. 1 2 3 4 "Mesa navideña: cada año el mismo dilema" (in Spanish). Diario Popular. December 16, 2012. Retrieved 25 December 2012. 1 2 3 "El sándwich de miga encarece la mesa navideña" (in Spanish). La Gaceta. December 9, 2012. Retrieved 25 December 2012. 1 2 3 4 "Christmas season celebrations in Australia". Culture and Recreation.gov.au. Retrieved 2007-03-12. 1 2 "Santa's Net: Recipes". Santas.net. Retrieved 24 December 2011. ↑ "Christmas Damper from Australia". Santas.net. Retrieved 24 December 2011. ↑ Florence Fadier-Rotsaert. "Thème: Histoire de rond et de cougnou" (in French). Retrieved 2007-03-09. ↑ Wombat, Missy. "Cola De Mono (Tail of the Monkey)". Recipezaar.com. Retrieved 24 December 2011. ↑ Blazes, Marian. 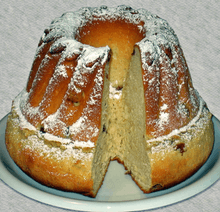 "Chilean Holiday Fruitcake - Pan de Pascua". southamericanfood.about.com. Retrieved 24 December 2011. ↑ "Danish food and drink". University of Southern Denmark. Archived from the original on 2007-02-05. Retrieved 2007-03-12. ↑ "Rice pudding". Archived from the original on 2006-09-25. Retrieved 2007-03-09. ↑ "Christmas in Europe, Where's Santa?". SourceWire. 2005-12-13. Retrieved 2007-03-09. 1 2 3 4 5 6 "Christmas cookbook". thisisFINLAND. Retrieved 2007-03-12. ↑ "Jouluoluet testissä - Ruoka.fi". Ruoka.fi (in Finnish). 2012-11-29. Retrieved 2016-05-06. 1 2 3 4 "French Christmas: It's all about the food". Expatica. Retrieved 2007-03-12. ↑ about.com, Noël in Provence Christmas traditions and recipes from Provence. Retrieved August 30, 2007. 1 2 "Christmas traditions in Provence". Provenceweb.fr. Retrieved 24 December 2011. ↑ Klaus Stahl/Chris Cave (2006). "It's all Napoleon's Fault - The success story of the Aachen Printe". Retrieved 2008-01-06. 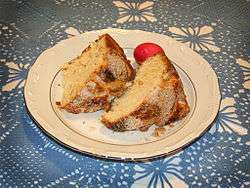 ↑ "German Christmas Recipes 2". German.about.com. Retrieved 24 December 2011. ↑ Stradley, Linda (2004). "History of Stollen, Dresden Stollen". Retrieved 2007-03-09. ↑ "Cakewalk in Allahabad - Times Of India". Articles.timesofindia.indiatimes.com. 2013-12-15. Retrieved 2014-02-13. ↑ "Getting the Christmas cake mix right - Times Of India". Timesofindia.indiatimes.com. 2013-12-14. Retrieved 2014-02-13. ↑ "Christmas in Italy". The Worldwide Gourmet. Retrieved 2007-03-09. ↑ Martiche, Nicole (16 November 2006). "The legend of Panettone". Retrieved 2007-03-09. ↑ Kahle, Lynn R.; Chʻung-hyŏn Kim (2006). Creating Images and the Psychology of Marketing Communication. Routledge. p. 48. ISBN 0-8058-5216-6. ↑ "An Introduction to Christmas Traditions". BBC. 2005-12-23. Retrieved 2010-12-24. ↑ Whipp, Lindsay (2010-12-20). "All Japan Wants for Christmas is Kentucky Fried Chicken". Financial Times. Retrieved 2010-12-24. 1 2 Burgos, Rowena (2007-12-23). "Yuletide fusion of flavors". Philippine Daily Inquirer. Retrieved 2008-12-06. 1 2 Galang, Diana A. (2007-12-09). "Culturefront: Christmas Culinary Traditions (Part 1)". Manila Bulletin. Retrieved 2008-12-06. ↑ Mama's Box - Online Spanish food Shop. "The definitive guide to Spanish Christmas food, in 20 delicious & easy recipes". Retrieved 2015-12-10. ↑ "Julmat - Allt som tillhör ett gott julbord en riktig god julmiddag". Ninasmat.se. Retrieved 24 December 2011. ↑ "Tips på recept på Dopp-i-grytan". Matklubben.se. Retrieved 24 December 2011. ↑ "Lutfisk med senapssås". Ica.se. Retrieved 24 December 2011. ↑ National Library of Trinidad and Tobago. "CHRISTMAS IN TRINIDAD AND TOBAGO". Retrieved 2015-10-20. ↑ Schroedter, Ulrike. "Christmas in Britain". Retrieved 2007-03-09. ↑ "Christmas food shopping uncovered". BBC News. 2001-12-17. Retrieved 2007-03-12. 1 2 "Christmas? What a waste!". BBC News. 2005-12-13. Retrieved 2007-03-09. ↑ BBC. "Roast Potatoes Recipe". ↑ "Pernil (Roast Pork)". The Rican Chef. Retrieved 24 December 2011.